Friday evening (3/28) at 9:09pm a M5.1 earthquake occurred in La Habra, which is under 10 miles from Disneyland. For more information on the quakes here is link to the USGS Summary of the event. The quake was preceded by a couple of smaller earthquakes and there were several aftershocks. I did not feel these smaller ones. Here is a map I grabbed from Bing.com. 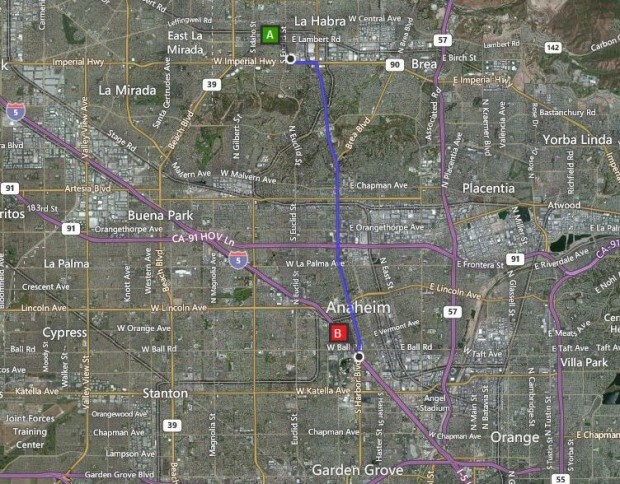 Point A is the epicenter of the earthquake and point B is Disneyland, they list the driving distance as 8 miles. The parks were both crowded due to it being a Friday night and Spring Break season. I was standing on the edge of the Rivers of America, near the Tom Sawyer Island exit gate watching Fantasmic. The quake struck right as the Columbia started its pass. It lasted for several seconds, long enough for everyone around me to look and ask is that an earthquake. The ground was moving very abruptly and it was among the stronger earthquakes I have felt. I took a quick glance around just to see what was around me and I was in a fairly safe area with not much in terms things that could fall, so I just stood there and watched. The Columbia kept going. I looked up at the nearest light tower and it was moving. Very soon after the shaking stopped the lights came on, the sound track and show lights continued for several more seconds as the Columbia slowed. Once the action stopped onboard the show lights were turned off and it slowly sailed by. Here is a video clip I found posted on YouTube this morning. It is not my video and much of it is not in focus but you can see the timing and what happened. Everyone around me instantly pulled out their phones and started the guessing game of how big was it and how close. The consensus was it was close and over 5 based on the fact that many of us knew about the earlier ones in La Habra (I did not feel either of those). After a couple minutes (that is a guess I did not think to keep a time log) they played an announcement saying that Fantasmic had been cancelled due to unforeseen circumstances. At this point it seemed everyone had decided it was time to move, me included. We inched along, I would say normal Fantasmic exit during the holidays, until I reached the Jungle Cruise. Then we stopped. 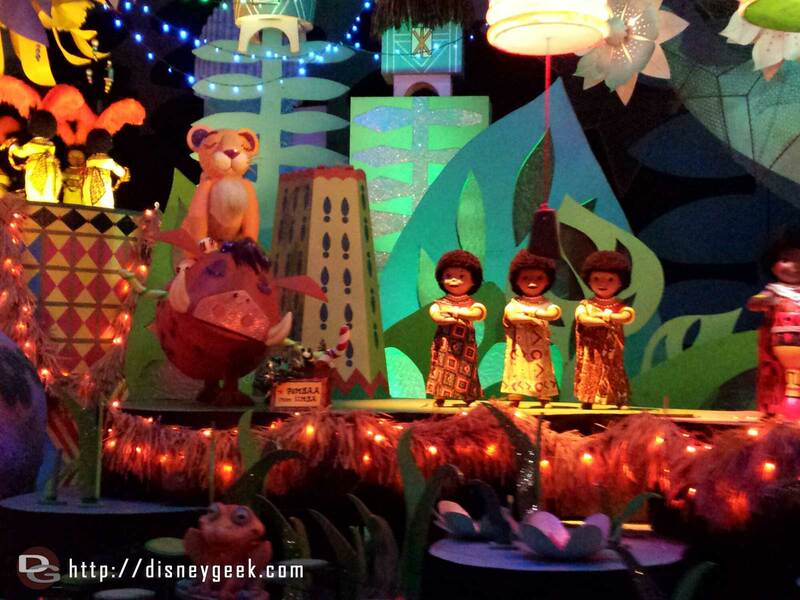 We did a very very slow shuffle, stopping at several times for minutes, from there to the Tiki Room Entrance. Once through the Adventureland gate things returned to a slow walk. Main Street was jammed and Remember had been cancelled (I heard no parkwide announcement about this). Luckily the backstage walkway on the West side was open so I took that and made it to the end of Main Street. It was about 9:45pm. So it took approximately half an hour to make it there. 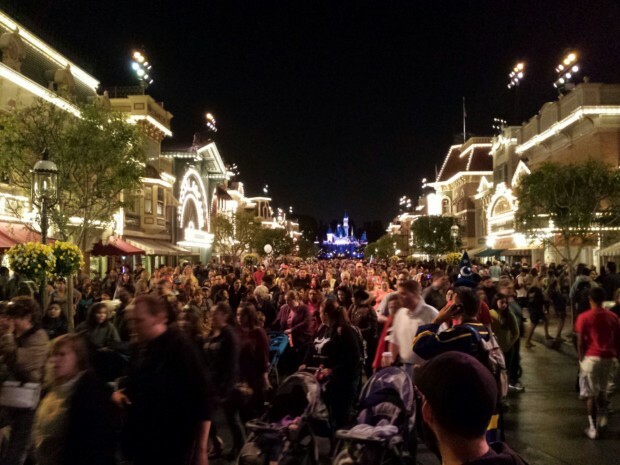 Main Street USA around 9:45pm as most guests decided to leave after the earthquake. After taking the above picture I decided to head for the Mickey and Friends Structure. The trams were backed up, maybe 2-3 tram wait so I joined the very large group walking to the structure. I arrived at the structure just after 10pm and found the elevators and escalators were still offline awaiting inspections. So you had to hike up the escalators or stairs. Guests that could not do this Disney was working with to find solutions, which appeared to be rides up by security from what I overheard. 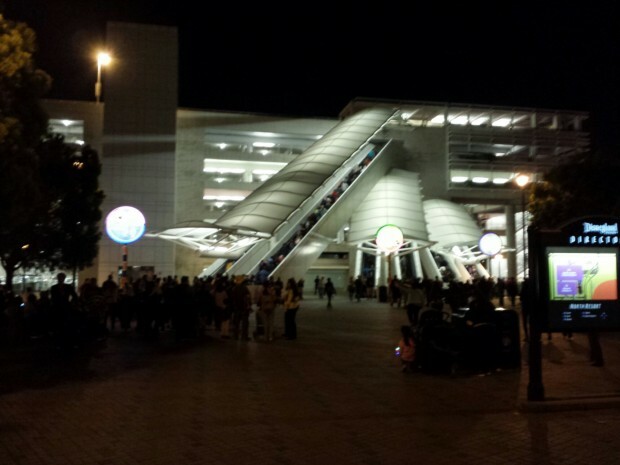 Mickey & Friends Parking Structure around 10pm – The escalators and elevators were still offline due to the earthquake less than an hour ago. 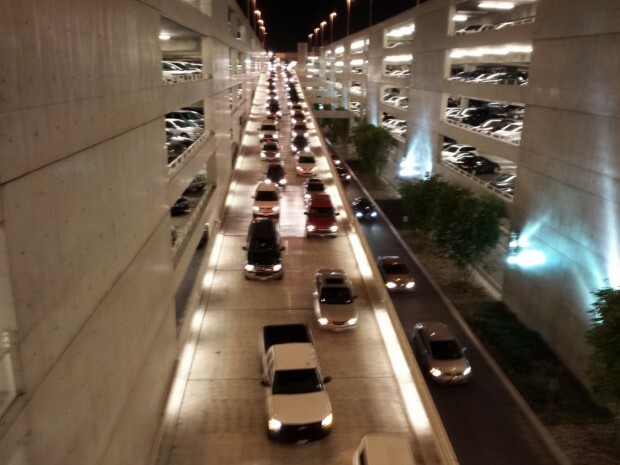 I made my way up to my car and took a look at the traffic. It was moving very slowly but moving so I checked the freeways (wanted to make sure no damage out there) then I made the decision to get in line and head for home. Here is a quick video I took from the walkway bridge. Note the traffic is set up like it normally is to exit. By the time I made it down there they were not merging lanes like you see in the video. They had everyone going straight. It took me about 15 minutes to get out of my row. We sat not moving for several minutes at a time. Then inched around the garage. Once I hit the exit ramp we were rolling along ok. I got stuck having to go through the Ball Road light. I had to wait two lights only. It ended up taking me just over half an hour from when I started my car until I was merging on to the I5 North. The guests in the park handled the event very well. Everyone around me was calm and more curious than anything. As we inched our way to the exit those around me seemed to be rolling with the crowd and near gridlock ok. I saw no one panic or causing problems in my immediate area. The Cast Members working the crowd control were doing the best they could to try and keep things moving and answer guest questions. Standard operating procedure after an earthquake at Disneyland is every attraction and other building are cleared, inspected, and once given a thumbs up reopens if it can. Cast members as well as local guests were explaining this to tourists and those that did not know. Due to the timing of the quake, after 9pm, and the cancellation of Fantasmic and Remember Dreams Come True many guests started heading for the exits, as the normally do after those shows. This led to many believing the park was closing and/or being evacuated. Neither of which was true. My understanding is the later Fantasmic as well as World of Color over at DCA were both performed. Also most attractions reopened later in the evening. I was really surprised by the cell coverage right after the event. I was able to send and receive some limited data. It seemed almost on par with what I experience on really busy days in the park. I was assuming coverage would be completely dead due to everyone being out in the park and checking their phones. Of course I was not taking video or even ready to take stills when the earthquake hit. I was just enjoying the show. Since I had seen it the previous couple of visits this time was just supposed to be a relaxing viewing. Then I did not think fast enough to get one out and on, so I have no video of the earthquake or immediate time after. I took a couple still pictures and will post them in my regular update/picture set. Were you in the parks? If so what was your experience like? I posted my full pictorial update from the day as well as more thoughts & observations. 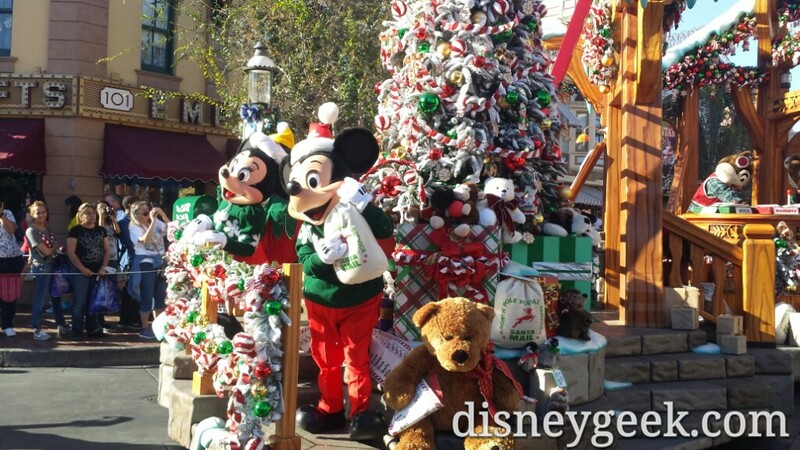 It features a look at the Springtime Roundup as well as my usual look around the parks. I was working at TLT at the time (having, thankfully, just reunited a lost child with his family BEFORE the quake). We evacuated the restaurant and met at the guest safe haven in Tomorrowland (the round ball). Everyone seemed calm which was good,and guests were understanding. Our restaurant ended up opening again around 945, until then we were just offering refunds, and once it was safe, a few meals to those who had already ordered, opening once we had enough food cooked to handle a large volume again. I know it was frustrating to tell guests that not only were the rides closed, everything was closed and I had no idea when we would open, but everyone was reasonable about it. After your experience, it seems like staying would have been best. I know they redid Fantasmic. It was nice to know that Disney has such a good policy and quick response. Very proud of my cast members and guests.